After you pick your Mechanism -- choose a Faceplate! Solid stainless steel latch and in the device body. This Model utilizes an external line conditioner (LC100) module to regulate input voltages, 11-29 AC or DC, and conditions the output for the pull-in activation period. Then reduces holding voltage output for continuous operation and reduced heat. 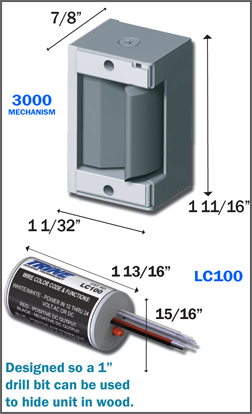 The LC100 provides current and voltage surge protection and kickback protection. LC100 must be used and installed within 15' of the mechanism.